The Nantucket Historical Association (NHA) is pleased to announce a generous donation from Julie Beinecke Stackpole of artifacts from the estate of Mary Ann Beinecke, Stackpole’s mother. The donation comprises artifacts and ephemera relating to Beinecke and her involvement with the Nantucket Looms, the Cloth Company of Nantucket, and the Nantucket School of Needlery. The collection of over one hundred objects, which includes many significant textiles and garments and a wealth of archival items, is an important addition to the NHA’s collection and tells the story of Beinecke’s central role in the craft revival on Nantucket in the 1960s and 1970s. Highlights of this donation include working documents from the needlework correspondence course, such as original manuscripts, illustrations, and needlework samples; samples of yarns developed by Beinecke; a book of color photographs and fabric samples from the Jared Coffin House project and the first years of the Nantucket Looms. 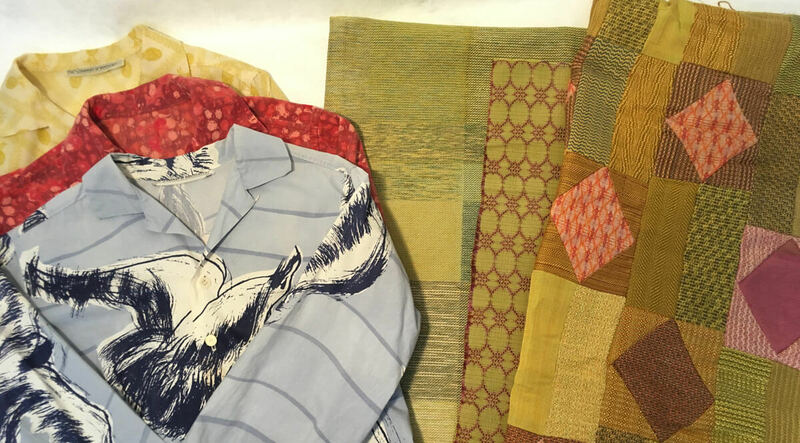 Several fabric samples, garments, and accessories tell the story of the growth of the Nantucket Looms during the 1960s, including innovative woven textiles designed by Beincke and Andy Oates. Also included in the collection are unique printed textiles by Leslie and D.D. Tillett from 1964-1968, when the Nantucket Looms expanded and was known as the Cloth Company of Nantucket. Julie Stackpole and her husband Renny have a longtime affiliation with the NHA, having made many important gifts of objects and archival works in the past, including artwork and the letters of Andrew Pinkham, the foundation for Renny Stackpole’s book Sea Letters. Renny is a former curator of the NHA and a son of Edouard Stackpole, once director of the organization. Julie is herself a skilled craftswoman, illustrator, and published costume historian. The NHA thanks the family for their continued generosity and foresight in entrusting the Nantucket Historical Association with this historically significant collection. These artifacts and their stories can now be shared with the public through the NHA’s online collections database, and included in future exhibitions and public programs.